In March, generosity filled a classroom’s collection jar beyond most typical school penny drives. Jesse Brown, 18, dropped in a $100 bill to help a Rathdrum girl being treated for leukemia. His Mountain View Alternative High School teacher, Mark Gorton, said that’s just the kind of person Brown is: polite, gracious, determined. Brown downplays his decision. Students were discussing donations needed to become the top-contributing classroom in the Blake Webb Pot O’Gold Penny Drive, an annual fundraiser to benefit someone in the community. He works at the Paul Bunyan restaurant in Rathdrum to earn that extra money. In his spare time, Brown repairs and sets up computers for himself and friends using mostly self-taught skills. In addition to high school classes, Brown takes technology courses at Kootenai Technical Education Campus in Rathdrum, where sometimes he also helps other students learn computer basics. His goal is to open a computer repair business after he gets an associate degree in computer engineering at North Idaho College. He then wants to earn a bachelor’s at University of Idaho in that subject. Brown is researching grants and scholarships to enroll at NIC this fall. “I’ve decided student loans are not an option,” he said. He and his family have lived in Rathdrum since he was almost a year old. For many years growing up, he did home-based studies through an online education program until he started at Mountain View. 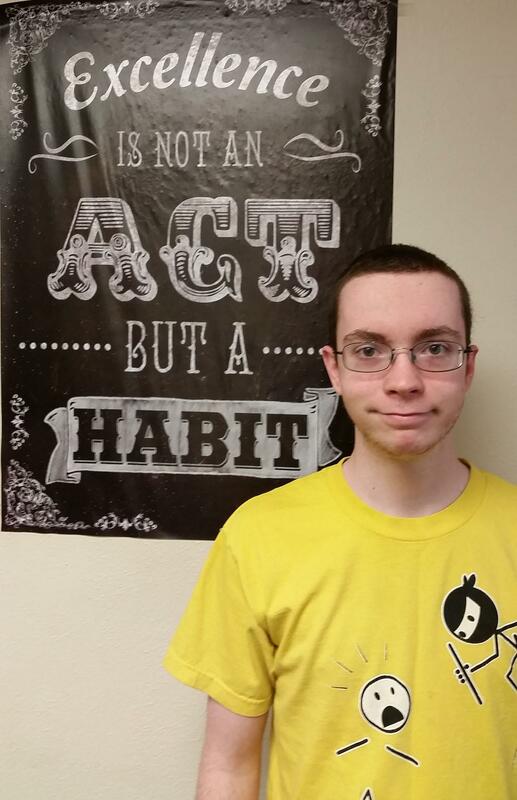 His best subjects are math and science, and he has earned recognition by Rathdrum Rotary as student of the month. Aside from computers and video games, Brown enjoys time with his dog, Mitzy, a water spaniel. He reads books on his computer while working, because he likes to multitask. Gorton, his teacher in government as well as for acting-public speaking studies, said he appreciates Brown’s inspiration to reach higher.